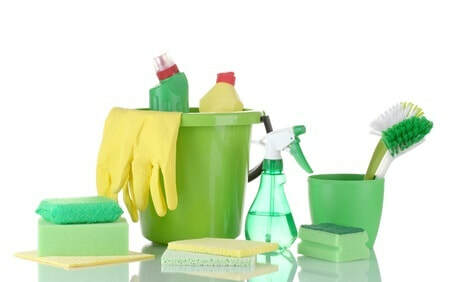 For most of us, spring cleaning is a huge undertaking. If you jump in blindly, you’re almost guaranteed to overlook some things. To make sure everything gets done, enlist the help of family members and follow this handy checklist. Dust from top to bottom. Start by dusting the ceiling, then move on to light fixtures and ceiling fans. Next, dust the corners, walls and doorways. Finally, dust wall hangings and furniture. Wash walls and doors. Use a mild cleanser, and be sure to do a spot test on painted surfaces. Clean doorknobs and light switches. Wash windows. Use a soft brush to remove dirt, dust and cobwebs, then clean with a sponge dipped in a 50/50 white vinegar and hot water solution. Clean window screens with a brush and mild dish detergent. Clean window coverings. Wash or dry clean curtains according to manufacturer’s instructions. Clean wood blinds with a soft cloth, and metal or vinyl blinds with mild dish detergent. Clean floors. Vacuum, spot clean and shampoo or steam clean carpets. Sweep or dust hard floors and clean as directed. Beat rugs, and have them professionally cleaned if needed. Change air conditioner and furnace filters. Move appliances and clean underneath and behind them. Clean out the cabinets and pantry. While they’re empty, wipe down the insides. Clean refrigerator and freezer. Unplug the unit and vacuum or dust the coils. Empty the refrigerator and freezer and clean with a mixture of baking soda and hot water. Wipe down the outside. Clean dishwasher. Add some vinegar or baking soda and run the machine empty. Wipe down the outside. Clean microwave and other small appliances. Boil a cup of water in the microwave to loosen grime before cleaning. Empty the toaster’s crumb pan, and wipe everything down thoroughly. Wipe down table, chairs and other furnishings. Move furniture and electronics and clean underneath and behind them. Clean furniture. Spot clean upholstered furniture. Take cushions and pillows outdoors and beat to remove dust. Vacuum the furniture, paying special attention to the crevices. Polish wooden furniture. Clean electronics. Use canned air to blow out dust. Wipe cabinets with a soft, dry cloth, and clean screens with a cleaner that’s safe for electronics. Dust pictures, lamps, knickknacks and other décor. Clean out drawers and closets. Sell, donate, recycle or throw away unwanted items. Vacuum the closet floor before putting everything back. Clean under and behind bed. Clean out vanity and medicine cabinet. Clean tub, shower, toilet and sink. Wash or wipe down shower curtain. Empty and wash the trash can. Clean porches, patios and walkways. Sweep cobwebs and dirt from porch walls and ceiling.